Next year’s conference will take place on 18 & 19 June 2019 in Hannover – further information are available here! The Water Research Horizon Conference (WRHC) is aimed to be a platform for the dialogue on the grand challenges in water research. In its frame, the scientific community meets annually to discuss among the various disciplines to be met and overcome by integrated approaches. The conference intends to catalyze the interdisciplinary ‘water science community’ to intensify the dialogue between scien-tists, practitioners, policymakers and stake-holders, in order to better address some of the challenges in todays and future water research, including the pressures of global change. 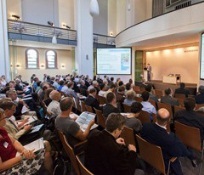 The event – initiated and for the first four years organized by the Helmholtz Centre for Environmental Research – UFZ is now carried out by the Water Science Alliance. The conference is not a scientific conference, where research results and projects are presented. We are seeking a new perspective to open questions, new ideas and stepping stones that may promote a strengthening of the community by pushing forward cooperation in fields that up to date lack interaction and knowledge about each other. As established in the last conferences of this series, two main overarching themes are set and discussed in different conference sessions. Open Space Workshops proposed and prepared by interested scientists serve as a platform for discussion with researchers and practitioners from different research fields. You will find the the results of the last conferences incl. the open space workshops at Archiv | Downloads!